Garlic cloves, minced --- 8 ea. Rosemary sprigs, minced --- 6 ea. In a bowl, place all ingredients except pork loin and bacon; mix until fully combined. 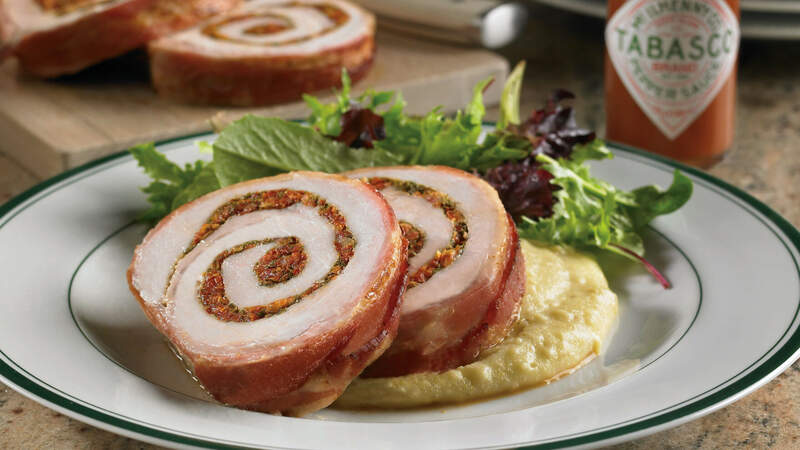 Spiral-slice pork loin to flatten into a sheet for a stuffed roll: Make a 1/4-in.-deep cut lengthwise all the way down the loin. Slice into the loin at that depth and continue slicing as you unroll the loin, until the entire loin is unrolled into one 1/4-in.-thick sheet. Spread the mixture from step 1 all over the inside of the unrolled loin. Lay out all the sliced bacon side by side. Roll the loin back up and place across the laid-out bacon strips at one end of the strips. Roll the loin, wrapping it in bacon. Where the bacon meets, secure the ends with wooden skewers. Place on a rotisserie and roast until cooked, approximately 1-1/2 to 2-1/2 hours. Allow to rest 20 minutes before slicing.